As most know, anytime that exhaust or air filter changes are made to a fuel injected bike a tune or remap is required to insure that the bike will maintain fuel economy, performance, and most of all engine safety. If these changes are not made you run the risks of having the bike run too lean or too rich which can potentially can cause engine issues. 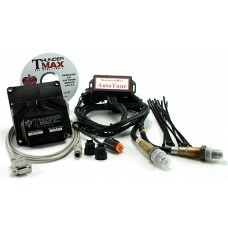 The ThunderMax with Auto Tune system is available for HD Engines. ThunderMax gives you a perfectly tuned engine under all ambient conditions, dramatically improving performance, drivability and fuel mileage for any exhaust system. 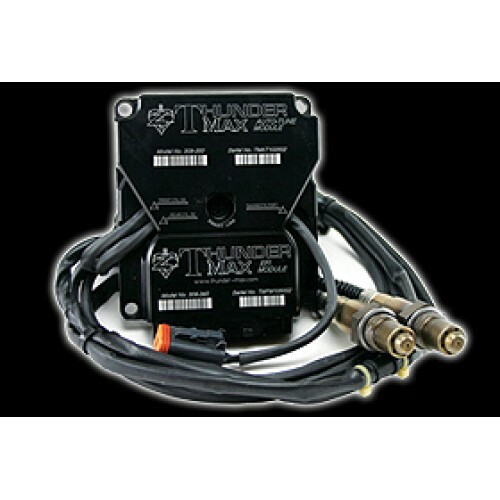 The ThunderMax AutoTune module analyzes the air/fuel ratio read by two wide-band oxygen sensors and makes any necessary adjustments. With every tank of fuel, at any temperature or elevation, your engines’ tune is optimized by ThunderMax! Would you like to have full control of your EFI system, with the freedom to make adjustments? The ThunderMax for HD models is purpose-built to deliver uncompromising performance. Installation is a straightforward replacement of the factory module and oxygen sensors*. Using the supplied SmartLink software and communication cable, you can load a map and go riding, and adjust or monitor virtually every parameter of the system. ThunderMax software, firmware and map updates are free and accessible 24/7 with an Internet connection. You’re only a mouse-click away from the latest available data and product support! Dyno Tuners can access Advanced User SmartLink software that allows full custom mapping. The ThunderMax is designed and manufactured in the USA and backed by a 3-year warranty! Highly refined maps included with the SmartLink software disc. Easily choose the best map for your application, minimizing tuning time for most configurations. NOTICE: Not legal for sale or use in States where emission laws apply. Purchase the Exhaust or Air Filter and we'll Combine Shipping and Refund the Overcharge after we ship!